The world needs heroes, now more than ever. 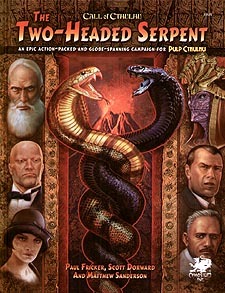 The Two-Headed Serpent is an action-packed, globe-spanning and high-octane campaign set in the 1930s for Pulp Cthulhu. The heroes face the sinister conspiracies of an ancient race of monsters hell-bent on taking back a world that was once theirs. Working for Caduceus, a medical aid organization, the heroes will loot a lost temple in the forests of Bolivia, go head-to-head with the Mafia in New York City, face a deadly epidemic in the jungles of North Borneo, uncover the workings of a strange cult in dust-bowl-era Oklahoma, infiltrate enemy territory inside an awakening volcano in Iceland, face hideous medical experiments in the Congo, race to control an ancient and powerful artifact on the streets of Calcutta, and ultimately travel to a lost continent for a desperate battle to save humanity from enslavement or annihilation! Packed with nine adrenalin-fuelled adventures, Keeper advice, gorgeous full-colour maps, and player handouts.